Chris Ferguson (born Christopher Philip Ferguson) was born on April 11, 1963 in Los Angeles, California. He is also known by his nickname "Jesus" because his look (long hair and beard) resembles that of Jesus. Ferguson won five World Series of Poker (WSOP) bracelets and is also the winner of NBC's National Heads-Up Poker Championship of 2008. When you see Ferguson for the first time, it never crosses your mind that he has a Ph.D. degree in computer science from UCLA. Both his parents have doctoral degrees in mathematics, and his father also teaches game theory and theoretical probability at the same UCLA Ferguson got his degree at. Ferguson uses his knowledge for his advantage at the poker tables and he always tries to improve his game using his highly mathematical style. Ferguson started playing poker even before he reached the age of 10. When he was in college, he used to play online for play money in chat rooms (IRC) and constantly tried to learn and improve his game. He began playing in tournaments in 1994 and in 1995 he participated in his first WSOP event. His first win at the WSOP came in the year 2000, as he won $151,000. Later that year, he won the WSOP main event as he defeated T. J. Cloutier to take home $1,500,000. Ferguson continued to win three more WSOP events during the years 2001-2003. 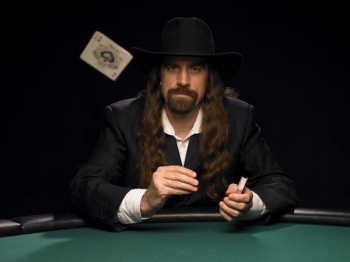 Chris Ferguson also had great success at NBC's National Heads-Up Poker Championship over the years. Although he only won at 2008, he always reached the high stages of the tournament and was close to the title a number of times. In 2005, Ferguson was very close to winning the championship but lost in the finals to Phil Hellmuth. A year later in 2006, Ferguson reached the finals again only to finish second to Ted Forrest. 2008 was the year Ferguson finally made it as he reached the final again to defeat Andy Bloch and win the title. His overall record in this tournament is the best as he has the most wins in the four year period the tournament is running. His overall record includes 16 wins and 3 losses. So far as of 2008, he has won over $7,300,000 in live tournaments only. Ferguson is always seen at the poker tables wearing a hat and sunglasses, and he usually sits in a similar motionless pose to make it harder for the other players to "read" him. There are some interesting facts you might not know about Ferguson. He is the president of a swing dancing club at UCLA, he is able to throw playing cards so fast that they can cut through bananas, carrots and even melons, he turned $0 into $10,000 playing on Full Tilt Poker, gaining cash from freeroll tournaments he won and using that cash to progress and play at small stakes cash games and so on up until he reached $10,000. His hometown is Pacific Palisades, California, and last but not least, although most people refer to him by his nickname (Jesus), Ferguson is actually an atheist. This gallery requires Macromedia Flash. Download Macromedia Flash.